Bele Macher Paturi / Fish cooked in Banana Leaf which is cooked in Banana Leaves. 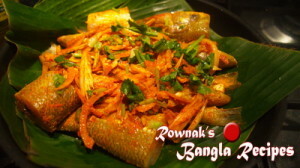 This is one of the traditional dishes from Bangladesh. The word “paturi” comes from the Bengali word “pata” or “leaf”. 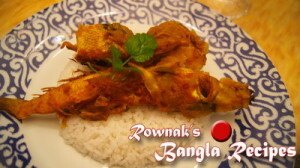 I used Sand Whiting (Bele mach Sorry I had different size fish) for this recipe. If you want, you can use your desire fish. When I was making, I thought that it could make in oven but for this I wanted to go for traditional way. 1. Clean fish; if you have big fish, cut it into 2″ pieces. 2. Marinate the fish with all ingredients and keep aside 1 tables oil. 3. Cut banana leaf, as big as you pan. We need 7-8 pieces of banana leaf. 4. Grease the two leaves with few drops of oil and place marinated fish pieces on one and cover with other one. Add 2 more leaves underneath and one more on it. 5. Place in a pan and cook it medium heat half hour under closed lid or till it dries up and gets little bit crust. 6. Flip it over and add rest of oil. If you need, you can change or add leaves on the top and cook 10-12 minutes. 7. Take out Bele Macher Paturi / Fish cooked in Banana Leaf from heat. 8. 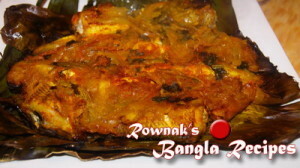 Serve Bele Macher Paturi / Fish cooked in Banana Leaf with plain rice. i just love it… yammy…..